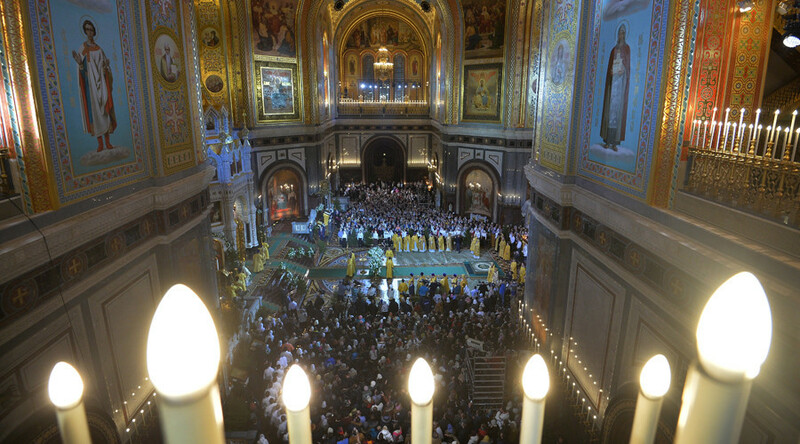 Orthodox Christians are getting ready for midnight liturgy to celebrate the birth of Jesus Christ. However, freezing weather has descended on Russia this Christmas Eve, with temperatures falling to -30C in Moscow and down to -40 in the regions. Those planning to attend midnight liturgy at Moscow’s Cathedral of Christ the Savior will have to put on an extra layer or two this Christmas, even if it will be celebrated by Patriarch Kirill. Temperatures in the capital are set to drop below -32 degrees centigrade (-25F) on January 7. Freezing cold is expected across the country, with some regions such as Siberia or Yakutia bracing themselves for -40C. Some 200 mobile food tents with hot meals will appear in Moscow during the Christmas celebrations due to the “freezing weather, to create comfortable conditions for the faithful who come to worship,” Deputy Mayor for Housing and Public Works Pyotr Biryukov said. Patriarch Kirill extended his best wishes to Orthodox Christians for the holiday, calling on them to show patience and tolerance towards each other. “Christmas usually gathers families and this is a wonderful tradition. A person gets peace, strength and inspiration in the circle of his family,” he said. The Orthodox Church follows the Julian Calendar, which is 13 days behind the Gregorian Calendar that was adopted by the Roman Catholic Church in the 16th Century. This is why Orthodox Christians celebrate Christmas on January 7, and not on December 25. Besides Russian Christians, Christmas is celebrated on January 7 by the Jerusalem Orthodox Church, the Serbian Orthodox Church, the Georgian Orthodox Church, and the Ukrainian Greek Catholic Church, as well as some Protestants who use the Julian calendar. The holiday is preceded by a 40-day Nativity Fast, when believers wait for the birth of Jesus. Those who observe the fast usually refrain from eating meat and deny themselves any form of entertainment. The fast ends with the appearance of the first star on the night sky of January 6, which is considered a symbol of Jesus Christ’s birth. Although Russia is a secular state, nearly three-quarters of Russians describe themselves as Orthodox believers. Christmas officially became a national holiday in Russia back in 1992. WATCH LIVE: RT to broadcast Christmas Service at Moscow’s Cathedral of Christ the Savior. Tune in at 20:00 GMT (23:00 Moscow time).